Goal: To demonstrate the widening economic gap in our society. Have 10 youth each sit in a chair. Each chair represents one tenth of the US population. 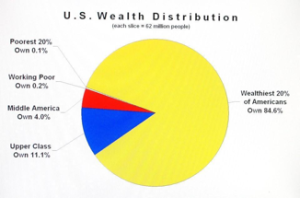 Ask how they would feel if the wealth was distributed evenly with each of them. Explain that the that is not how the wealth is actually distributed. To demonstrate wealth distribution in 1976, ask 1 person to occupy five chairs and the remaining nine to share the other 5 chairs. Then, demonstrate distribution for wealth today: one person has seven chairs, one person has two chairs, two people share one chair, and the remaining six people sit on the floor. Ask everyone how they feel about this distribution? How does this play out in our society? Seen lots of versions of this. Sometimes it takes dramatization to make it real.